See Wikipedia:OCLC for its use in Wikipedia. The Online Computer Library Center, Inc. (OCLC) is "a nonprofit, membership, computer library service and research organization dedicated to the public purposes of furthering access to the world's information and reducing information costs". It was founded in 1967 as the Ohio College Library Center. OCLC and its member libraries cooperatively produce and maintain WorldCat, the largest online public access catalog (OPAC) in the world. 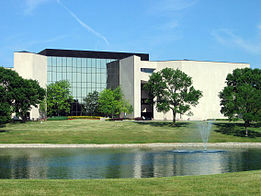 OCLC began in 1967, as the Ohio College Library Center, through a collaboration of Ohio university presidents, vice presidents, and library directors who wanted to create a cooperative, computerized network for Ohio libraries. The group first met on July 5, 1967 on the campus of the Ohio State University to sign the articles of incorporation for the nonprofit organization. 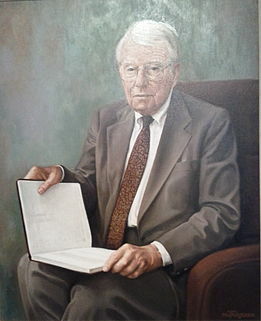 The group hired Frederick G. Kilgour, a former Yale University medical school librarian, to design the shared cataloging system. Kilgour wished to merge the latest information storage and retrieval system of the time, the computer, with the oldest, the library. The plan was to merge the catalogs of Ohio libraries electronically through a computer network and database in order to streamline operations, control costs, and increase efficiency in library management. The goal of this network and database was to bring libraries together to cooperatively keep track of the world's information in order to best serve researchers and scholars. The first library to do online cataloging through OCLC was the Alden Library at Ohio University on August 26, 1971. This was the first occurrence of online cataloging by any library worldwide. As OCLC expanded services in the United States outside of Ohio, it relied on establishing strategic partnerships with "networks," organizations that provided training, support and marketing services. By 2008, there were 15 independent United States regional service providers. OCLC networks played a key role in OCLC governance, with networks electing delegates to serve on OCLC Members Council. During 2008, OCLC commissioned two studies to look at distribution channels; at the same time, the OCLC Members Council approved governance changes that had been recommended by the Board of Trustees which severed the tie between the networks and governance. In early 2009, OCLC negotiated new contracts with the former networks and opened a centralized support center. The Online Computer Library Center acquired the trademark and copyrights associated with the Dewey Decimal Classification System when it bought Forest Press in 1988. A browser for books with their Dewey Decimal Classifications was available until July 2013; it was replaced by the OCLC Classify Service. Until August 2009, when it was sold to Backstage Library Works, OCLC owned a preservation microfilm and digitization operation called the OCLC Preservation Service Center, with its principal office in Bethlehem, Pennsylvania, U.S.
OCLC produced catalog cards for member libraries beginning in 1971 with its shared online catalog; the company printed its last catalog cards on October 1, 2015. OCLC commercially sells software, e.g., CONTENTdm for managing digital collections. OCLC's most recent advocacy campaign, "Geek the Library," highlights the vital role of public libraries in the current challenging environment. One goal of this community-based public awareness campaign is to increase local library support by encouraging the public to share what they 'geek', using the word as a verb. The idea is that every person has a passion that they 'geek' from modern art to chemical engineering, and that the library supports all of the passions in the community. The campaign, funded by a grant from the Bill & Melinda Gates Foundation, uses a strategy based on the findings of the 2008 OCLC report, "From Awareness to Funding: A study of library support in America." OCLC partnered with search engine providers in 2003 in order to advocate for libraries and share information across the broadest possible Internet landscape. Google, Yahoo!, and Ask.com have all collaborated with OCLC in order to make the WorldCat records searchable through those search engines. OCLC has a database, WorldCat, for cataloging and searching purposes which is used by librarians and the public. Contributions to WorldCat are made via a computer program, Connexion, which was introduced in 2001; the Connexion predecessor, OCLC Passport, was phased out in May 2005. WorldCat contains records in MAchine Readable Cataloging (MARC) format contributed by library catalogers worldwide who use OCLC as a cataloging tool. These MARC format records are then downloaded into the libraries' local catalog systems. This allows libraries to find and download records for materials to add to their local catalog without the lengthy process of cataloging each individually. As of March 2015, the OCLC database contained over 336M records with 2.2 billion cataloged items, and is the world's largest bibliographic database covering 72,000 libraries. Connexion is available to professional librarians as a computer program or on the web at connexion.oclc.org. See Template:OCLC for ways to use OCLC links in references in Wikipedia. OCLC assigns a unique control number (referred to as an "OCN" for "OCLC Control Number") to each new bibliographic record in the WorldCat. Numbers are assigned serially, and as of mid-2013 over a billion OCNs had been created. In September 2013, the OCLC declared these numbers to be in the public domain, removing a perceived barrier to widespread use of OCNs outside of OCLC itself. The control numbers link WorldCat's records to local library system records by providing a common reference key for a record across libraries. OCNs are particularly useful as identifiers for books and other bibliographic materials that do not have ISBN numbers (e.g., books published before 1970). OCNs are used as identifiers often in Wikipedia and Wikidata. In October 2013, it was reported that out of 29,673 instances of Infobox Book in Wikipedia, "there were 23,304 ISBNs and 15,226 OCNs"; and regarding Wikidata: "of around 14 million Wikidata items, 28,741 were books. 5403 Wikidata items have an ISBN associated with them, and 12,262 have OCNs." OCLC acquired NetLibrary, a provider of electronic books and textbooks in 2002 and sold it in 2010 to EBSCO Industries. OCLC owns 100% of the shares of OCLC PICA, a library automation systems and services company which has its headquarters in Leiden in the Netherlands and which was renamed "OCLC" at the end of 2007. In June 2006, the Research Libraries Group (RLG) was merged into OCLC. On January 11, 2008, OCLC announced that it had purchased EZproxy. It has also acquired OAIster. The process started in January 2009 and from 31 October 2009, OAIster records are freely available via WorldCat.org. In January 2015, OCLC acquired Sustainable Collection Services (SCS). SCS offered consulting services based on analyzing library print collection data to help libraries manage and share materials. Other mergers and acquisitions are listed on the OCLC website. ^ "Cooperation". OCLC. Retrieved 2010-03-18. ^ "About OCLC". OCLC. Retrieved 2010-03-18. ^ Intner, Sheila (March–April 2007). "The Passing of an Era". Technicalities 27 (2): 1, 13–14. Retrieved 2012-08-28. ^ Jordan, Jay (2010). Bates, Marcia J., ed. Encyclopedia of Library and Information Sciences V (3rd ed.). New York: CRC Press. p. 3924. ^ Bailey-Hainer, Brenda (2009). "The OCLC Network of Regional Service Providers: The Last 10 Years". Journal of Library Administration. doi:10.1080/01930820903238792. ^ O'Neill, Nancy (Nov–Dec 2004). "Open WorldCat Pilot: A User's Perspective.". Searcher 12 (10). Retrieved 8 March 2015. ^ "WikiD". Retrieved 5 March 2015. ^ "deweybrowser.oclc.org". deweybrowser.oclc.org. Retrieved 2014-04-30. ^ "Preservation Service Center". OCLC. Archived from the original on 2003-12-29. ^ "QuestionPoint". OCLC. 17 February 2014. Retrieved 2014-04-30. ^ "OCLC prints last library catalog cards". OCLC. 1 October 2015. Retrieved 2 October 2015. ^ OMG! You Don't Need CONTENTdm!!! ^ Hyatt, S.; Young, J. A. (March 2005). "OCLC Research Publications Repository". D-Lib Magazine 11 (3). doi:10.1045/march2005~hyatt. ^ a b c De Rosa, C. (2009). "Advocacy and OCLC". Journal of Library Administration 49 (7): 719–726. doi:10.1080/01930820903260572. ^ "See also" Grossman, Wendy M (January 21, 2009). "Why you can't find a library book in your search engine". The Guardian. Retrieved Sep 15, 2014. ^ "Advocacy: From Awareness to Funding, the next chapter". ^ "A global library resource". oclc.org. ^ Wallis, Richard (24 September 2013). "OCLC Declare OCLC Control Numbers Public Domain". ^ HangingTogether.org (11 October 2013). "OCLC Control Numbers in the Wild". ^ Jordan, Jay (17 March 2010). "Letter to members 2010". OCLC. Archived from the original on 2010-03-26. ^ Rogers, Michael (30 October 2007). "CLC/OCLC Pica Merge". Library Journal (New York). ^ "OCLC acquires EZproxy authentication and access software" (Press release). Dublin, OH: OCLC. 11 January 2008. ^ Price, Gary (13 January 2015). "Print Collections: OCLC Acquires Sustainable Collection Services". Infodocket. Retrieved 6 March 2015. ^ "Mergers and Acquisitions". Retrieved 6 March 2015. ^ Beall, Jeffrey (2008). "OCLC: A Review". In Roberto, K.R. Radical Cataloging: Essays at the Front. Jefferson, NC: McFarland & Company. pp. 85–93. ISBN 0786435437. OCLC 173241123. ^ Coyle, Karen (29 July 2010). "SkyRiver Sues OCLC over Anti-Trust". Karen Coyle. ^ Breeding, Marshall (29 July 2010). "SkyRiver and Innovative Interfaces File Major Antitrust Lawsuit Against OCLC". Library Journal. Archived from the original on 2010-08-02. ^ Price, Gary (4 March 2013). "III Drops OCLC Suit, Will Absorb SkyRiver". Library Journal. Coyle, Karen (Dec 22, 2011). "National Library of Sweden and OCLC fail to agree". Coyle's InFormation. Spalding, Tim (February 23, 2009). "Research libraries clobber OCLC Policy". Thingology Blog. Library Thing. This page was last modified on 4 May 2016, at 07:36.